Zip backed pyjamas to help get everyone get an uninterrupted night’s sleep. 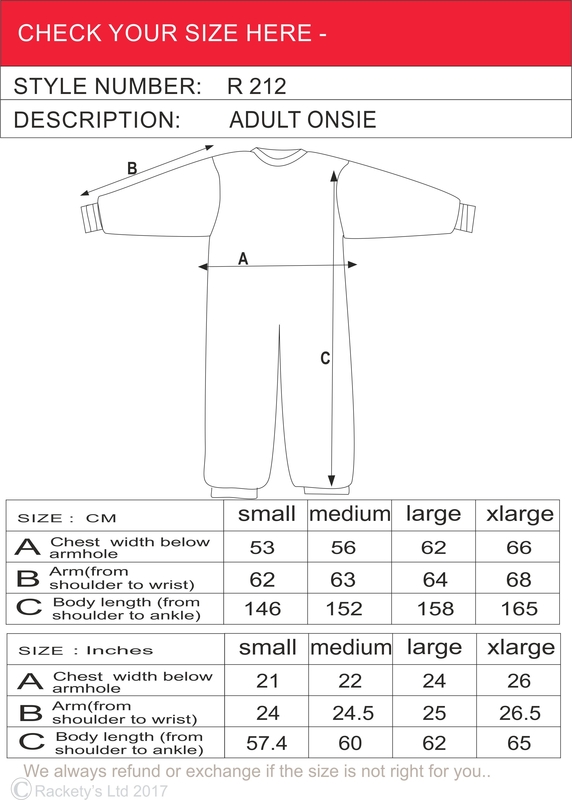 We have graded up the sizes of our childrens zip backed pyjamas by popular request. Many of our customers have grown up wearing the pyjamas and because they work so well ,they want to carry on supplying them as their children grow up. The Zip back Onsie style is strengthened to help prevent determined strippers or nappy dippers from creating havoc during the night. Great details to keep the pyjamas on all night so you do not need to worry about waking up to find that the user is freezing cold having stripped off or find the contents of the nappy’s decorating the bedroom walls.. The pyjamas will also help to if the wearer is inclined to pull at or pull out their tubes in the night. Great new onsie style design with orange trim detail- this is now officially a fashionable item- it looks great and helps to overcome very serious night time problem. PLEASE NOTE: There are no feet on the adult onsie. PLEASE ALLOW APPROXIMATELY 14 DAYS FOR ORDER WITH PATTERN FABRICS OR NEW COLOURS. ♥ 94% soft cotton knit fabric 6% elastane. ♥ Double popper fastening to keep the zip from being pulled undone. ♥ Zip Back fastening with soft backing so you are not lying on a bare zip. ♥ Strengthened neck seams to prevent the most determined from tugging the necks open. ♥ Washable at 40 -we do NOT recommended tumble drying. Adults with learning difficulties or physical disabilities. Help train the user not to pull off their nappies or pads.